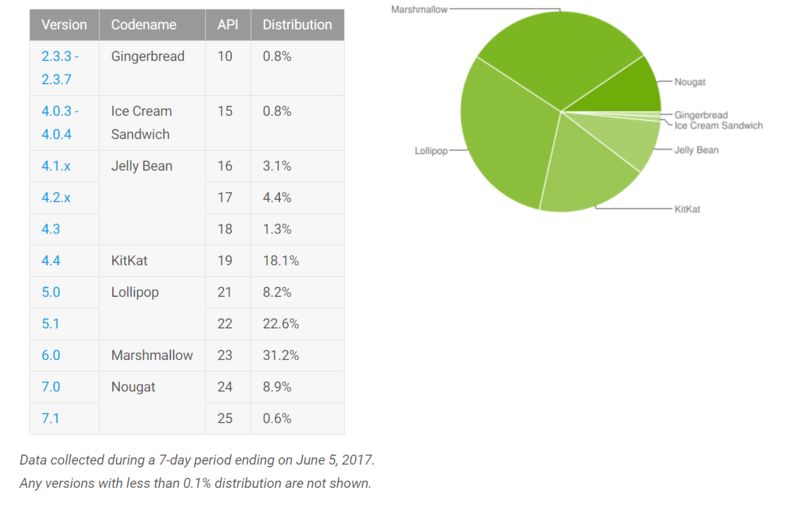 Google has released the June Android Distribution Report and it continues to show a picture of challenges. Android Nougat gained 2.4% over the May report but it still sits below 10% of the total install base of device that hit the Play Store for the week ending June 5, 2017. That is a very slow adoption rate for a platform that has been out for 8 months and one that its successor, Android O, is already in the beta channels. Equally as challenging is that Android Marshmallow remained at 31.2% of the install base, the exact same number it has had for three reports running. Android Lollipop, version 5.x, dropped to 30.8% this month, down from last month’s 32%. If there is a positive in all of this it is that the last three versions of Android are on 71.5% of all devices hitting the Play Store, but that is covering nearly 3 years of Android builds. Android devices starting with Android O, allowing Google to update the core platform independent of the manufacture updates. It will take years for this to roll out but it will go a long way in solving the challenges facing Android adoption. As for those of you who come to ClintonFitch.com, the numbers are slightly more encouraging. 42.78% of you came to the site during the same reporting period on Android Nougat, up 3.87% over last month. Android Marshmallow saw a slight drop to 34.02% this month while Android Lollipop dropped to 30.93%, down 3.41% for the month.